Shifting the large institutional asset base towards sustainable investments would mark a big step forward in making the world more resilient. Swiss Re’s brand promise “We’re smarter together” is also applicable to responsible investing: We interact with policymakers and other market participants to promote ESG considerations in the investment process, for example with a keynote speech held by our Group CIO at the CFA/PRI event in New York in late 2017. As an active member of the OECD’s long-term investor network, we also engage in the development of policy proposals with regard to sustainable infrastructure and ESG. Knowledge sharing is another key aspect of promoting responsible investments. We offer all Asset Management employees various internal ESG training opportunities to ensure consistent know-how across the board. Furthermore, we are in an ongoing dialogue with other industry participants to develop ESG as a standard investment approach. 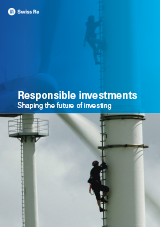 To provide further insights on our switch to ESG benchmarks, we launched the publication “Responsible investments – Shaping the future of investing” in 2017. It shares our experience and methodologies relating to further promoting the development of best practice frameworks (see box below). Our consistent integration of ESG criteria resulted in an award in the category “Best ESG Programme” at the 2017 Institutional Investor Swiss, German & Austrian Peer-to-Peer Awards. We also became a member of the ICMA Green Bond Principles in 2017. This reflects our view that the industry needs a more standardised responsible investing market environment with agreed definitions, standards, methodologies and best practices to move the long-term investor base further towards systematic ESG integration. Because of their long-term view, institutional investors such as re/insurers are naturally suited to focus on responsible investing. There are still various hurdles on the way towards a broadly accepted, standard approach to integrating ESG into the investment process. Close collaboration between the private and public sectors would help to overcome these obstacles and contribute to a more resilient world.